[Relwin] has being working on using LEDs as bi-directional devices. The setup above allows him to use each LED as an input, looking for a bright light source and then syncing up with the activity it receives. It is the most basic of communications using the components. The hardware at the heart of the system is a PICAXE development board on the left. The blinking light to the right causes the LED on the left of the picture to blink, but moving the blinking source over to that side will reverse the effect. The chip is programmed to play a tune on a piezo buzzer whenever a connection is lost. What is interesting to us is that these green LEDs will not detect a red LED flashing because the voltage threshold is different on the detector side of things. He’s got some code available, but we’re really looking for the ideas of what to do with this concept. Maybe something along the lines of LED matrix video puzzles, or a variation on this laser-pointer LED game. Watch the demo video after the break and then let us know what you would use it for by leaving a comment. I was going to say: Didn’t the “Le Dominoux” guy already do this very thing? Then the video finished loading, and I see that it’s him! Green led won’t respond to red led because of the junction band-gap. It can only be excited by photons of the same (as emission) or higher energy level. for example, a yellow or green emitter led will stimulate a red ‘sensor’ led. @justDIY: That is true in ‘most’ situations. If you have a high enough energy, you can start phenomena such as multi-photon absorption, in which case the band gap is less of an issue. Alistair, you obviously went to a well funded school that had money to spend on stuff like LEDs. You’re either very VERY old or you’re still there. And by very I mean like 35 or something. We couldn’t afford curricula in my day. You could use this as a key to unlock a secret door/display/whatever. Is that just another status LED? Why, no, it’s a secret code receiver! Just point a key-fob LED flashlight at it and tap out the code to open it. Unfortunately I’ve forgotten the name, but I remember seeing a microcontroller platform which was reprogrammed by holding it up to your computer screen. It would blink a section of the screen (center of a flower from memory?) 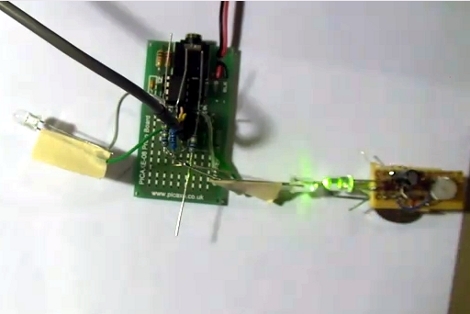 to communicate data to an LED receiver on the board… slow, but elegant and quite a cool idea. Is it just me, or does the alarm sound like the “communication” they used in close encounters of the third kind? I’ll accept this as proof that the TV is watching you. A while ago there was a paper about this, but I can’t find it. Anyway, nice to see others are working on this. Why does it have to be the commenters (here http://hackaday.com/2011/03/15/picaxe-using-leds-to-communicate/#comment-359323 and there: http://relwin.hackhut.com/2011/03/10/19/#comment-content-36) to point out the references? Now thats interesting. The first idea that occured to me involved putting a cheap plastic fiber optic thread between the leds (if that would work) then you could use this as a different way to network devices….sort of like USB (have to check and see how fast a led can blink on and off)…add a couple of wires and you could supply power as well, perhaps using modified power jacks and connectors for the data/power. Or…you might be able to turn that status led on your next project into a easy access diagnostic port. Have to give this some more thought….